Hello, I am a tomato. An heirloom tomato. Whatever that means. I am also yellow. This is my natural color. This is how I like to be eaten, yellow. Currently, I am in someone's stomach, but I will live forever in your heart. And in this picture. ...I wish you were in my stomach. 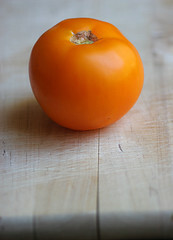 heirloom means it can reproduce itself from itself, its open pollinated. hybrids are cross pollinated by hand and if the seeds are saved, you wont grow the same tomatoes from them, if anything grows at all. heirlooms are good stuff, their seeds grow true, and they're pollinated by bees or wind. heirlooms have not been "bred", but rather gardeners choose the best vegetables from the crop and saved their seeds.